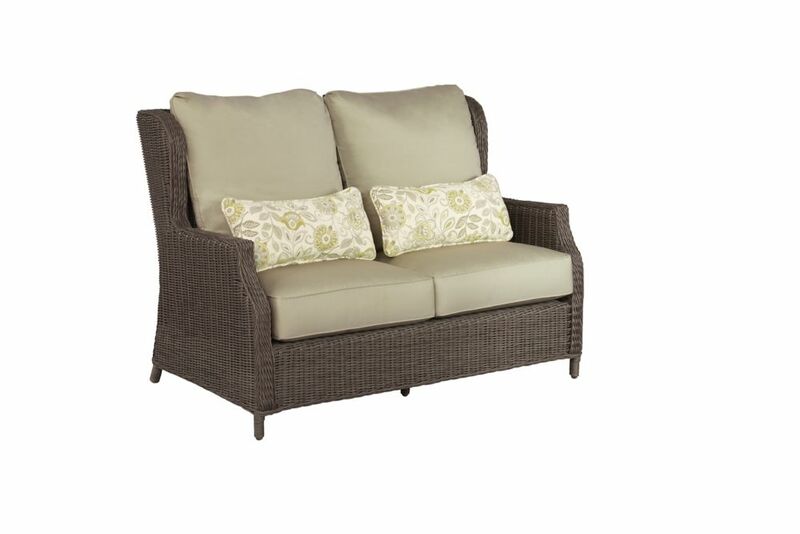 Vineyard Patio Loveseat Inspired by the Provence region of Southern France, Vineyard is fashioned from chateau style manors, with subtle wingback details. Vineyard features a whimsical profile that is suited for country living or chic cottage design with a conscious blend of classical styling and technology. The design combines resin weave and aluminum, two of the most durable and weather resistant materials in the industry. The frames are welded, powder-coated and then meticulously hand-woven with resin weave to simulate the look and feel of real wicker but with added durability. The motion lounge chair includes a hydraulic recliner lift that allows for infinite adjustments. Seating pieces include cafe chair, motion lounge chair, ottoman, loveseat, sofa and infinite adjustable chaise lounge. Matching occasional, cafe and coffee tables accommodate both dining and deep seating.